Do You Have Harmful Gum Disease in Virginia Beach? Some patients avoid flossing between their teeth because they don’t like when their gums become sensitive and start to bleed. Does that sound familiar? 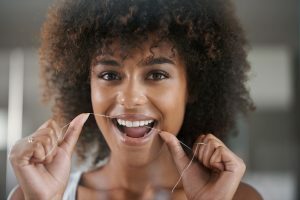 Well, if you’re one of those patients who doesn’t floss regularly, you’re avoidance may actually cause you to develop gum disease in Virginia Beach. If you experience discomfort during your dental routine, bleeding, or swelling, you should speak to either Dr. Santos or Dr. Folck at Smile by Design. The key to preventing severe dental problems down the road is catching unhealthy gums in their early stages before the disease develops into its advanced stage: periodontal disease. It may be helpful to your dental and systematic health to ask yourself these questions if you think your gums may be diseased. Are your gums tender during your dental hygiene routine? Do you notice blood—even a little—while you’re brushing or flossing? Have you noticed puss along your gum line or between your teeth? Do your permanent teeth feel loose? Are your gums starting to recede and show the roots of your teeth? Do you see pockets or bulges along your gum line? Do you have bad breath no matter what you do? There are many different factors that affect your gum health—not just poor oral hygiene. Consider these factors when you think about your habits and if they’re preventing or causing a decline in oral health. Smoking makes it difficult for the gum tissue to repair itself. Hormonal changes during pregnancy, menopause, puberty, and menstruation, cause the gums to become more sensitive, making it easier for gum disease to develop. Illnesses like cancer, diabetes, and cancer can affect the condition of your gums and make it hard to fight off gum disease because your immune system is compromised. Medications tend to affect oral health because some create dry mouth, reducing your natural saliva flow (which is a protective effect on teeth and gums). Poor Oral Health Habits like not flossing or brushing daily will make it easier for gum disease to develop. Genetics also can be a contributing factor in the development of gum disease. How can Smile by Design Help? If one of our dental professionals notice that you have beginning signs of gum disease, he may recommend that you come in for more frequent, thorough professional cleanings. If frequent professional cleanings aren’t reversing the effects of gum disease, we may provide you an in-depth, non-surgical cleaning known as scaling and root planing that can help you regrow healthier gums (periodontal therapy). Dental scaling is the most common nonsurgical way to treat gum disease or its advanced form, periodontal disease. We will use our expertise, attention to detail, and up to date dental tools to remove infectious materials. Sometimes, if your gums are extremely infected, we will also remove the infected tissue. This step makes it easier for your rejuvenated, healthy gums to grow back and reattach to your teeth. Your dentist will smooth the surfaces of your tooth roots. Root planing also prevents further infection down the road. Do you need help restoring your gum health? Contact our Virginia Beach office to schedule an appointment. Remember. The sooner you detect gum health issues, the sooner we can get your oral health back on track! Comments Off on Do You Have Harmful Gum Disease in Virginia Beach?